Thanks to Reg Counsell for the pic. to linda. i remember ur dad george. he used to give my brother and i pennies for the machines. he knew us as billys kids and knew stan and eileen northover was our aunty and uncle. did u know young stanley and his wife pat? they had children beverley, simone and also a son lloyd who sadly died. did u go to eastchurch primary school? my name is tina maylum and i have great memories of leysdown on the 60's. my dad was billy maylum and called bingo at the golden nugget i think. 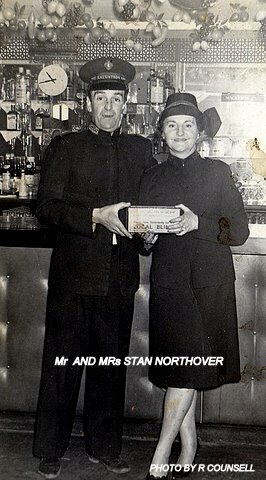 his sister eileen married stan northover so i felt like i had a celebrity aunt and uncle. i remember visiting the big house with the sweeping staircase going up both sides of the room, carpet about s foot deep and sbout 5 chihuauas. we lived in seaview gardens and i remember Toms shop at the bottom of the road. does anyone remember the blue lagoon open air swimming pool. I assume STANS was the arcade i can recall opposite the GOLDEN HORSESHOE ? I remember them well. They were 'CELEBS' before the word was invented. Eileen was very kind to me in my childhood and they were good friends of my dad George Parlane and his partner, Audrey. They were the most generous people you could ever dream of and started out with nothing. Stan started his bingo with bottle tops to cover the numbers painted on boards and a tennis ball thrown into a wooden painted grid. Eileen began with a cafe and knew all the tricks of the trade. We visited them at their large flat over the NEW VENTURE, later the WELLWORTH ARCADE which my dad bought from Stan in 1958. May they rest in peace or ... rather be having a great time wherever they are. I remember Stan and his wife visiting my parents, Joe and Rose (Rosie) Dempsey, in the 1960's and my mother's obvious dislike for both of them. Stan wanted my father to go into partnership with him in amusements in Leysdown and my mother absolutely forbid it.